NEWS FLASH! 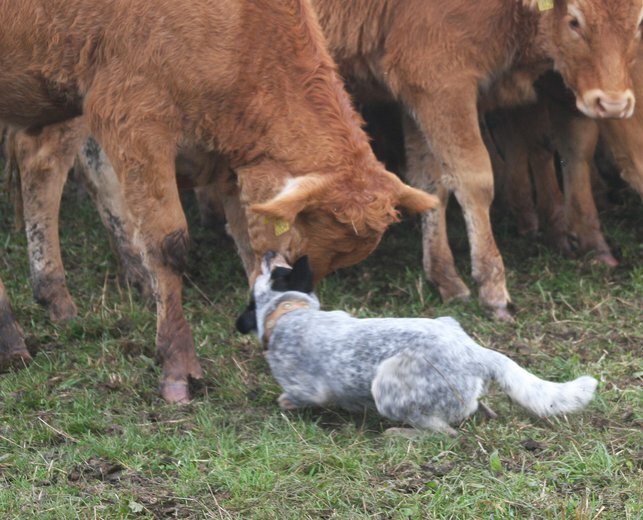 Valor's dam just made history by becoming the first ACD in Europe to earn her Advanced Herding Title on cattle! We really liked her power on stock, outrun and genetic testing results (PRCD A, BAER Normal, great hip score), and afterwards made plans to secure a pup out of her in the future. 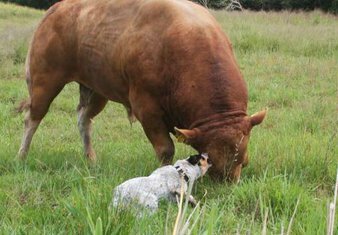 The next spring, she was bred to a great male dog that we exported some years back, Edde Spader. We were delighted to get "Valor", a striking blue male from this litter. Valor is a very handsome dog, and is growing into a big dog with great movement. We really like his disposition and type, and are excited for his future. He is BAER Normal, Obligate PRCD A, and is in the top 10% of the breed on the PennHIP & had a perfect prelim Elbow evaluation. Valor is a really nice blend of confidence with a strong desire to please his handlers. He loves a game of fetch!